Do you have a garden pond or a fishpond that needs regular cleaning or maintenance? It’s a big job and for some property owners, it’s a job that often gets pushed down the list of things to do because they just don’t want to deal with the cleaning and maintenance required. Home Style Fishponds is a family owned and run business located in sunny Brisbane. With experience in cleaning and maintaining fishponds in a warm and humid environment, we will ensure your fishpond is sparkling clean, keeping your fish and pond plants healthy. We are a friendly team of 3 who are eager to help you help with your fish pond needs. Will Rinas is our manager who looks after the clients and makes sure the jobs get done. Kristina looks after the admin of the business and Alex takes care of the marketing. We also work with contracts to make sure we can tackle the bigger job in an effective manner. There are plenty of benefits to having a garden pond or a fish pond in your home. They add a visual aesthetic becoming a focal point of your front or back garden, and with the addition of water features, lighting and statues, they provide an extra level of peacefulness to your garden. The auditory appeal of a pond, especially one with a water feature is a big benefit to any home. The peaceful sound of water running can act as white noise, blocking out noise from traffic or neighbours. Ponds also provide a safe haven for native wildlife looking for a drink and a place to cool down in the harsh summer sun. Home Style Fishponds can provide a regular, one-off or emergency service, and if you happen to be going away, we can service your pond, meaning you come back to a clean and healthy pond. Our team members are always on time and can provide full details of what they are doing, any maintenance your pond may need, and how you can upkeep your pond in between professional cleaning and maintenance. 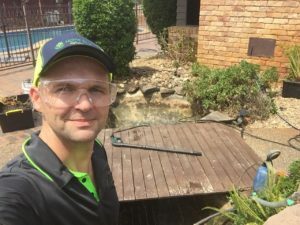 Whether you need pond cleaning and maintenance at your Brisbane home or office, our team will provide you with a top quality service at an affordable price.